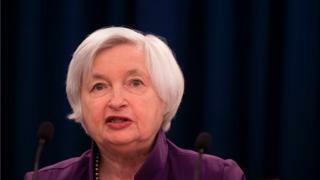 The US Federal Reserve has raised its key interest rate by 0.25%, the second increase this year. The central bank voted to raise its key rate target to a range of 1% to 1.25%. That's the highest level since 2008, when policymakers cut rates to encourage borrowing and spending after the financial crisis. The bank also said it would begin cutting its bond holdings and other securities this year. It cited continued US economic growth and job market strength as reasons for raising its benchmark interest rate. "Our decision ... reflects the progress the economy has made and is expected to make," said Federal Reserve Chair Janet Yellen. Data on Wednesday showed US consumer prices unexpectedly fell in May and retail sales recorded their biggest drop in 16 months. This has raised questions about the bank's future course. But the rate increase was already priced into most stocks. Should the Fed have done it? The case against is inflation. The Fed's statement noted that price rises have slowed recently. Inflation is below the target of 2%. But then Fed Chair Janet Yellen thinks a large part of that is down to falls in specific prices. She mentioned cell-phone plans and prescription drug prices. Over time their impact will drop out, and she and the committee expect inflation to get to the target in time. The rate rise continues the Fed's slow return to normality after the financial crisis. The journey is not over. The Fed's policy makers think about 3% is the new normal. There's also the legacy of quantitative easing and the $4.2trn portfolio of financial assets. Really normal will mean running that down - though perhaps not to pre-crisis levels. It will take a long time and it hasn't begun yet, but the Fed does expect to make a start later this year. Federal Reserve policymakers have been grappling with when and how to alter the policies put in place after the 2008 financial crisis to boost economic activity. At the time, they slashed interest rates and bought up US treasuries and mortgage-backed securities to keep rates low. The Fed has a $4.2trn portfolio of Treasury bonds and mortgage-backed securities, most of which were purchased in the wake of the financial crisis and recession. In 2014 the bank stopped its bond purchase program, known as quantitative easing, but it has continued to reinvest the assets on its books. On Wednesday, policymakers said they aim to reduce that balance sheet, by reinvesting payments from those securities only above certain caps, totalling $10bn. Ms Yellen said she's not sure how far the committee will want to reduce the holdings over the long run, but she said they would be levels "appreciably below" those seen in recent years though larger than before the financial crisis. Wednesday's decision was made with an 8-1 vote, with Neel Kashkari, president of the Federal Reserve Bank of Minneapolis, dissenting. Mr Kashkari also voted against the March rise. On Wednesday, the US Labor Department reported that prices for goods excluding food and energy increased by 1.7% from May 2016, slowing steadily from earlier in the year. That fell short of the Federal Reserve's target of 2%. Ms Yellen said the bank is aware of the shortfall and it was "essential" to move back to the target. But she said this year's data may be skewed by one-off factors, such as lower prices on cell phone plans. "It's important not to overreact to a few readings," Ms Yellen said. "Data on inflation can be noisy." Greg McBride, chief financial analyst for Bankrate.com, said the cumulative effect of recent rate increases on consumers is "mounting". "The combination of rising debt burdens and rising interest rates is straining some households, with delinquencies picking up from recent lows," he said. In broader terms, the economic impact includes a stronger dollar and higher bank profits.